Norfolk | Can Men Cook? Do you go on holiday to sunbathe? Read? Enhance your cultural horizons? Write? Or to eat differently? OK – we do all of these. But there tends to be a bias in every day towards the food bit! So, some short pieces about all and everything we ate in Norfolk recently. On the way, we dropped into a pub from the old Good Pub Guide. We were still in Cambridgeshire. (You do forget how far the north of Norfolk is from South Bucks!) Just a snack, then? Yes, the Red Lion at Hinxton does both major and snacky stuff. Fun 16th century pub, in a marvellous village. We had a prawn and avocado sandwich. With a simple side of chips, and a beer or cider doesn’t tell the whole story. This is all about ingredients. Bread – white – doughy, toothsome and very strongly scented. Yes, it just makes you want the rest of what’s inside it. Overpacked, so most bites let out a prawn or piece of avocado. The chips? Newish spuds. Skins on. Vinegar and salt. Heaven. We had snack level, because we were having a M&S Chinese meal at the self-catering cottage. I do love their crispy duck, with the hoi-sin sauce and pancakes and the spring onions and cucumber all there for you. We enjoyed finding our most local-ish pub. It was The Walpole Arms at Itteringham. Gastro level – it is the 15 quid type of lunch not £ 7:95. That’s fine. Our Sirloin of beef had a lot of fat running through it, which is where the taste is of course. Served rare, and played in the modern style. The loin of pork seemed even better in its way. Both meats are from local suppliers. But this is both barley and pig country. So I guess the pork had grown up locally too. Proper serviettes here too. Always makes the whole experience more special to me. Daft I know… I did enjoy their choice of 5 house reds and whites. Also served in 50 cc carafes. Great idea…and the same price per cc, so you don’t get the bottle just to save a bit! (I am mean with some things…). Good food, well presented and fun place with a superb garden. Monday was a bit of a retro day…we made some sandwiches and took a banana and a bag of crisps. Only because we were going on a train ride and a cruise on the Broads. That’s what holidays are for. Spending a good part of the day just doing it…going and coming back and just loving the doing…At night, we had salads and bits. Easy, fast, and hot buttered new spuds helped entice us. And even more retro on day 3. Norwich. Jeff Koons exhibition. Fab. Chips? Found a Wetherspoons next to Norwich Castle. Look, it is what it is. £3.99 for ham egg and chips. Two eggs, ok ham, good small portion of chips. There is a reason the places are rammed. 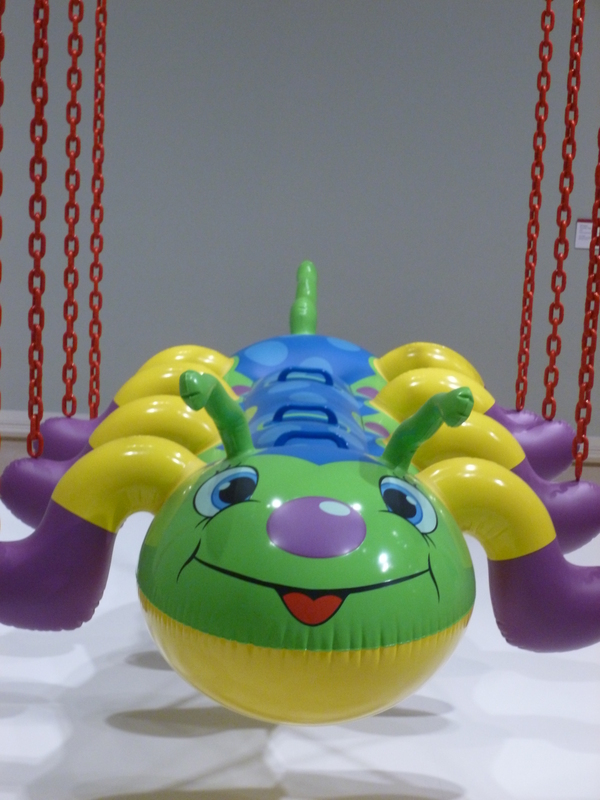 A Jeff Koons sculpture – great fun! The Pigs at Edgefield? Well, we did lunch then big evening meal here – and guess what? They specalise in all thinks porky! Oh, and a lot more besides…e.g. Iffits – Norfolk Tapas equivalent! Whitebait, Smoked Prawns or locally shot pigeon just some of the examples from the menu. Take a look here – great fun, and very friendly…. We never knew how full of piggeries north Norfolk was until driving around a bit…there seems to be a large pig field on every other farm. So food miles will be sensibly low! Roast Loin of Wolterton Lamb, redcurrant sauce, wilted spinach and fondant potato.